Best moment: Leaving the house on first day of trip. Several songs came through my earbuds that made the perfect weather (70 and sunny) seem even more perfect (i.e. Little Dragon Crystalfilm, Rolling Stones Wild Horses, Bill Withers Lovely Day, LCD Soundsystem Home, etc, etc, etc). Worst moment: Two actually... First, when wind hit incredibly hard and had me riding at an angle of around 20° for approx two hours. Second, when I woke up this morning and the temp was 32.9°F. Even with these, it was one of the most monumental and amazing two days of riding I've ever experienced. Most embarrassing moment: This morning, as I'm packing up w/ frost covering everything (warming my hands every two minutes on the moto exhaust) I did something incredibly awesome. Imagine the spring loaded tent legs in the picture to the right. As I'm breaking down one of the legs, it springs up with incredible force and smacks me directly in the middle of my forehead. Seriously?!? I still have a red diagonal line on my freaking forehead. I had to laugh at the time, but damn it hurt! And it still hurts!!! Seriously??!?!?!!!? 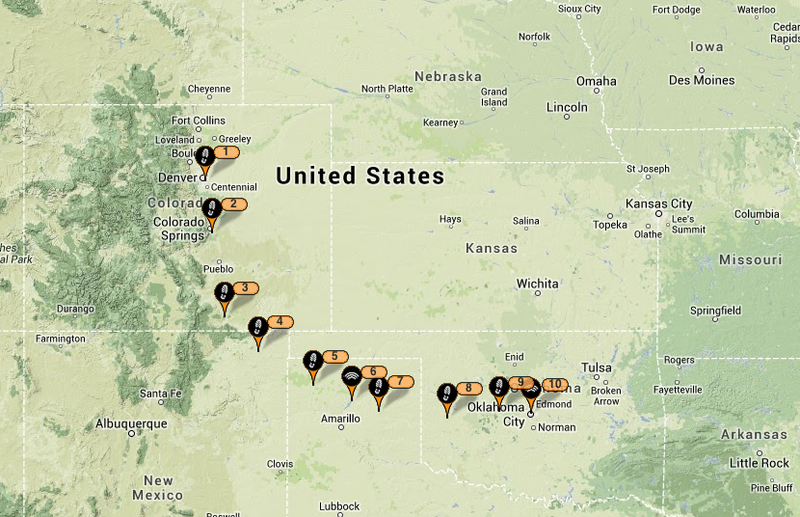 Summary: So as you can see, I started in Denver and headed south, southeast, then east. A few things stand out from the trip. One of the most notable was the waving. It started right away... as cars would pass I noticed people waving. This wasn't a typical "how are ya?" wave, or a "good day" kind of wave. There was something behind the waves. So much in fact that I started counting them. All-in-all I noticed no less than 22 waves throughout the ride the past two days. The people behind the waves were clearly saying "go for it" and "Godspeed". I even noticed people slowing and smacking their kids to "look, look at the crazy motorcyclist riding from Colorado". There were also the 'tips of the hat' from obvious other motorcyclists who could tell that I was on an adventure. I have to say, I felt pretty damn cool behind my helmet, and it felt great. It was like I had a highway support group of sorts. Shot from Middle of Nowhere, New Mexico. My view. Anyway, I made it to Oklahoma City today. Sorry to cut it so short, but I'm with a really nice CouchSurfing host named Ivey who has cracked a bottle of red wine and is starting a movie for us. I'll try to update this further. If not, I'll fill in the gaps when I get to Little Rock (next stop), or Nashville (next, next stop). I can't believe this is happening and I can't wait to share more as the adventure progresses. Nice pics. I am glad your trip has started out well. All those waves are people wishing they were as free as you, enjoy it.